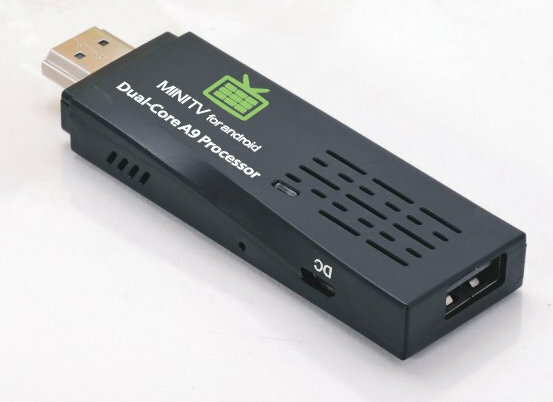 After all the Rockchip RK3066 mini PCs (UG802, MK808, UG007…), and a few AMLogic AML8726-MX mini PCs (announced but yet to be available), there’s a new dual core HDMI TV stick platform in town: Kimdecent T21 based on Nufront NS115 dual core cortex A9 processor with a dual core Mali-400 GPU. Kimdecent T21 mini PC runs Android 4.1.1 (Jelly Bean) and is shipped with a AC Charger Adapter (5V/2A), a USB Cable and an English user manual. There’s no indication if the micro USB port is OTG or just host. In the later case, it means you must use the power adapter to power the device. The company also claims it supports XBMC, but I would doubt it makes use of hardware decoding. Nufront NS115 was announced in May 2012 as the third generation processor designed by the company, and appears to be used in a limited number of products (Tablets) starting from August/September 2012. Some benchmarks (done in June…) appear to indicate Nufront NS115 performance is between AMLogic AML8726-MX and Rockchip RK3066. Please note that the benchmarks were performed at 1.5 GHz (Antutu: ~7000), but the processor is just clocked at 1.2 GHz as for the Rockchip RK3066 mini PCs to avoid overheating. Since the processor is not very widely used it might be difficult to get the firmware files, let alone some source code, although Kimdecent usually makes the firmware available on its website. Kimdecent T21 is available now on Aliexpress for $49 including shipping, which is a very competitive price for a dual core mini PC, even though I have seen UG802 for as low as $46.50 once but they’ve raised their price since.